and we left our sunglasses in the car at the hotel. 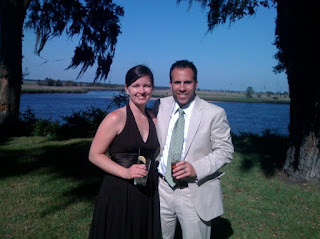 Matt and I spent a wonderful long weekend in Richmond Hill, GA (just outside Savannah) to celebrate our friends' wedding. Mark and Jenn threw a fabulous party at the Ford Plantation. We ate good food, drank wonderful wine (it helps when the groom is head of US sales for a winery), played amazing* golf and swatted numerous no-see-ums. I may have left with the feeling of having chicken pox, but chicken pox was never this much fun**. *Amazing in the sense that the course was gorgeous and we played best ball and finished 4 under. I love best ball. ** I'm not sure if I have a chicken pox memory - my pediatrician's diagnosis wasn't solid. Instead he said "if Susan never has chicken pox again, then this was it. If she does, then it wasn't." Awesome. Matt, on the other hand, definitely knew he had chicken pox. And poison ivy. At the same time. While moving from Syracuse to Shrewsbury. And he has the [adorable] scars to prove it. Aw. You two look SO cute! Sounds like a fun trip!